My lemon-obsessed summer began in the British Museum on a very rainy, very grey May afternoon. Museums are perfect for these kinds of days. An exhibition of warm, sunny watercolour paintings of Rome, a talkative and funny Roman friend, an espresso, and a squidgy lemony cake all had me feeling very Nigellissima and desperate to be Italian. Walking through the bookshop on the way out and faced with a wall of escapist Italian history/travel/art books, I found the most summery looking cover (lemons) and promptly bought it. The Land Where Lemons Grow turned out to be my ultimate summer read. 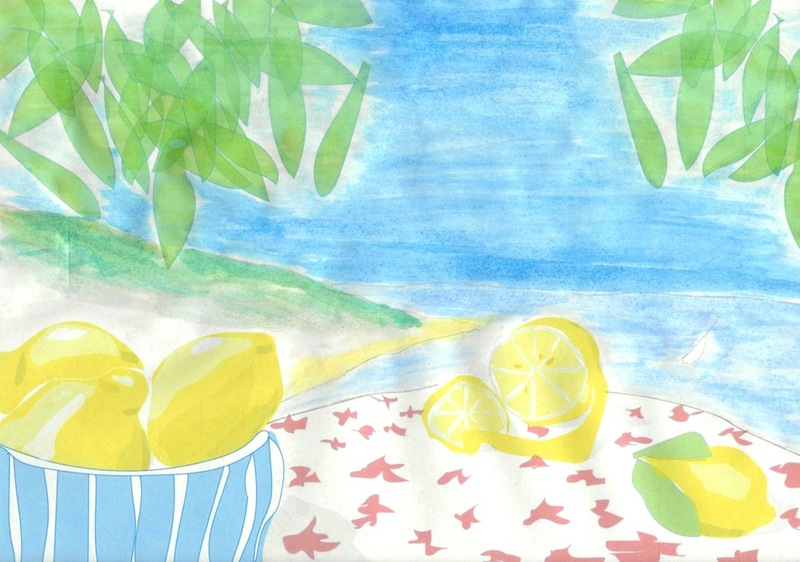 Under writer Helena Attlee’s guidance, lemons become the medium for my Roman Holiday/ La Dolce Vita style summer dreams. Described as ‘the story of Italy and its citrus fruit,’ reading The Land Where Lemons Grow is like having a conversation with your incredibly clever and well-traveled friend who can casually explain everything about the importance of lemon groves for the Sicilian mafia, to the Princess of Nerola’s role in making neroli a popular ingredient in perfume. All while pouring you a perfectly made Negroni. It’s a totally transportive book. In reality, however, I’m not clambering along the Amalfi coast, I’m plopped here in rainy London. Which is fine because holiday dreams need room to grow, time to develop, and I also need to learn at least one helpful Italian phrase other than ‘ciao.’ As inspiration I’ve eaten zesty lemon pasta, seafood with a squeeze of lemon, soooo very much lemon gelato, and if there’s a better summer drink than one involving lemons I do not acknowledge it. Lemonade, Lemon & Mint San Pellegrino, Limoncello, iced tea with lemon, and (because I contain multitudes) Campari, which is technically made from a more orange-type-fruit rather than lemons, but it’s Italian and therefore I love it. I have my book, my dream, and I have my lemon-flavored everything. So, to complete the conjuring of this holiday, a brief-ish list of the essentials needed for evoking your lemon grove-traipsing best summer-self. Because like Nora Ephron wrote, ‘be the heroine of your own life,’ which in this case I take to mean ‘be the heroine of your own summer,’ wherever you might be spending it.